Downtown Portland from the Willamette River. Photo by Matt Strieby (08/18/04). If the toss of a coin had but gone the other way, we’d be talking about Boston, Oregon (thank goodness that didn’t happen). In the 1840s, city founders Asa Lovejoy and Francis Pettygrove shared claims on a 640-acre site along the Willamette River known as “the clearing,” about halfway between the territorial capital of Oregon City and Fort Vancouver. Since each wanted to name the new city after his hometown, they settled the dispute by flipping a coin. Pettygrove, who was from Portland, Maine, won the toss. Though Portland grew for a while in the shadow of Oregon City, it soon overtook its southern neighbor. 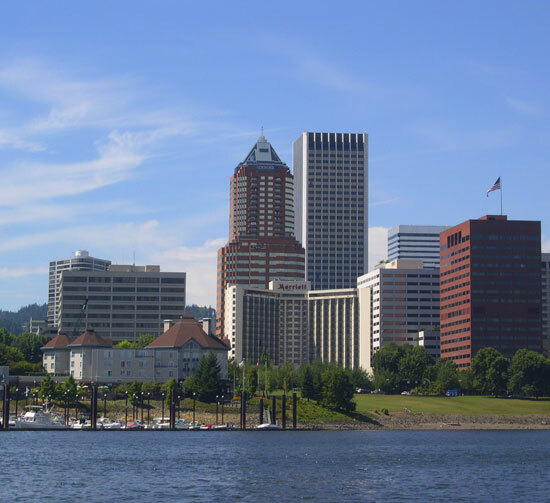 Portland’s prime location near the confluence of the Willamette and Columbia rivers was reachable by ocean-going vessels and the city blossomed as a shipping port. Portland’s position as the Pacific Northwest’s leading city would, however, eventually fall to Seattle. 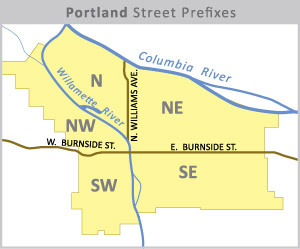 The city of Portland is divided into five sections for street prefixes: Southwest (SW), Northwest (NW), North (N), Northeast (NE) and Southeast (SE). Avenues run north-south while streets run east-west. These prefixes extend into most of Portland’s suburbs, but some cities (like Gresham and Hillsboro) have their own street grid. This can be very problematic where the two grids meet. Generally speaking, avenues are numbered and streets are named, with the exception being in North Portland where the avenues are named as well. In Portland’s west hills, serpentine streets make the name/number grid system impractical, so most of those streets bear names, too. Urban planners nationwide have praised the Portland metropolitan area as a model of how to keep urban sprawl in check. During the early 1970s, there was concern that Portland would go the way of other western metropolitan areas and turn into a Los Angeles-like sprawl of freeways and far-flung suburbs. The administration of then-governor Tom McCall, along with farmers and environmentalists, convinced the state legislature to pass the nation’s first set of land use planning laws. This landmark legislation required every county and city in Oregon to create a long-range plan that established urban growth boundaries. Although these boundaries could be modified, they created an impetus to keep urban sprawl into adjacent farm and forest lands in check.1 These boundaries, combined with the low, mountainous terrain on the west side of the Willamette River, give the Portland area a compact, high-density feel, especially when compared to some other western cities that seem to spread without end in all possible directions. The anti-sprawl effort, coupled with a statewide anti-freeway sentiment that naturally accompanied it, also put a check on most new freeway construction (Interstate 205 being one notable exception). Several freeways that were planned during the 1960s and early 1970s were later scrapped, two of the most notable being the proposed Mt. 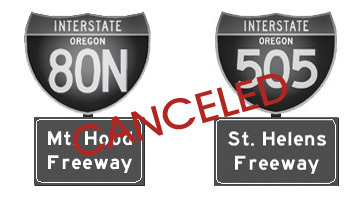 Hood Freeway (which would have rerouted I-80N through southeast Portland)2, and the St. Helens Freeway (I-505). Ghost ramps for a third proposed freeway (The Rose City Freeway) are visible at the northern I-5/I-405 stack interchange. 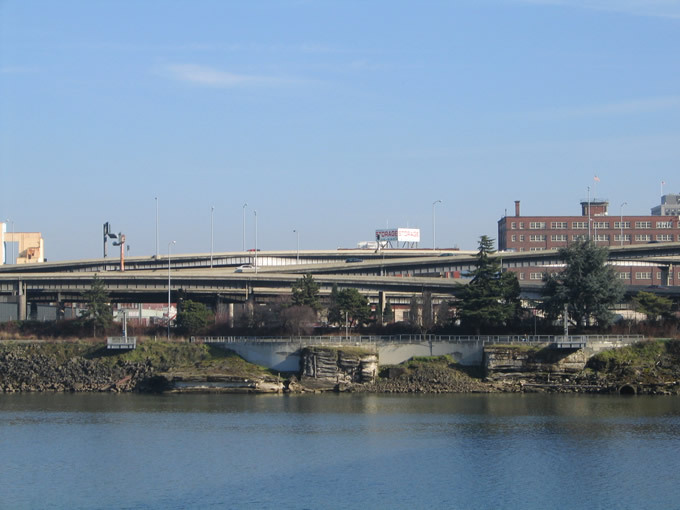 The anti-freeway sentiment was even strong enough to seal the demise of an existing controlled-access highway: most of SW Harbor Drive, which carried U.S. 99W along the west bank of the Willamette River, was demolished in 1974 to make room for a park. The story of the freeway’s demise is a tale of urban America after World War II and a lesson in what distinguishes Portland from other West Coast cities. It gave us strong neighborhoods, proud schools and MAX. It cemented the region’s commitment to ecology and the reputation of a brilliant political leader. The murder (of the Mt. Hood Freeway) not only saved 1,750 households in Southeast Portland from the wrecking ball, it also established Portland’s philosophy of urban livability-the idea that cities are for people, not just for commerce and cars. From the south, Interstate 5 enters the Portland metropolitan area at Wilsonville in Clackamas County. It then passes through the suburban towns of Tualatin, Tigard, and Lake Oswego before crossing into Multnomah County at exit 294. Interstate 5’s entire Multnomah County journey takes place inside Portland city limits. Hilly terrain makes for a twisty trip from exits 294 to 298. The name “Baldock Freeway” is usually only used for the segment of I-5 west of the Willamette River. After Interstate 405 splits off to head downtown at exit 299B, I-5 crosses the Willamette River over the two-level Marquam Bridge and follows the east bank of the Willamette River where it heads through a jungle of overpasses and flyover ramps at the Interstate 84 and northern Interstate 405 interchanges. The river bends west, and I-5 continues a northbound trajectory through Portland neighborhoods to the Columbia River. Major junctions along Interstate 5 in the Portland metro area are with Interstate 205 (exit 288), Oregon 217 (exit 292A), Interstate 405 (exits 299B and 302B), Interstate 84 (exit 300), Washington 14 (Washington exit 1A), Washington 500 (Washington exit 2) and again with I-205 just past Washington exit 7. Known as Interstate 80N prior to 1980, Interstate 84 emerges from the Columbia River Gorge and enters the east end of the Portland metropolitan area at Troutdale. Along the route to its western terminus with Interstate 5, I-84 is co-signed (although sometimes sporadically) with U.S. 30. Also known as the Banfield Freeway, Interstate 84 is the primary east-west freeway on the eastern side of the Willamette River. Major junctions along Interstate 84 in the Portland metro area are with I-205 (exits 6 through 9), and Interstate 5 at its western terminus. There is a partial interchange with Oregon 213 (82nd Avenue), but access is only provided for eastbound traffic. An eastbound MAX train cruises alongside the westbound lanes of Interstate 84 in Portland. Photo 09/02/06. 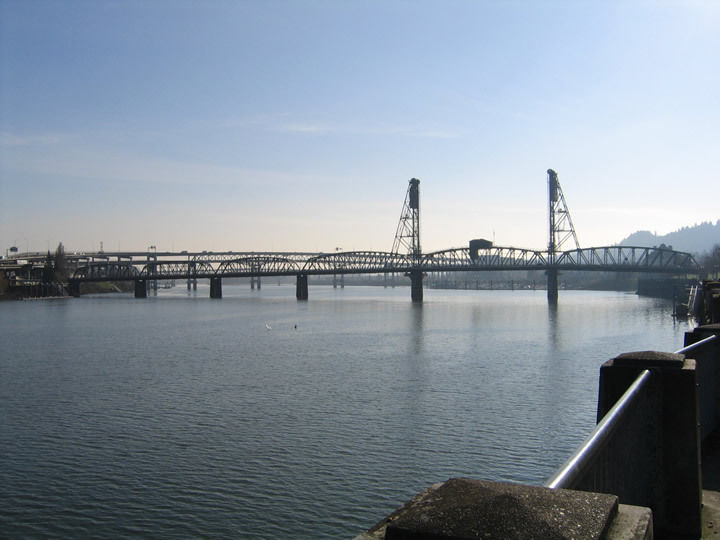 The last major freeway to be constructed in the Portland metropolitan area, Interstate 205 was completed in 1982 with the opening of the Glenn Jackson Bridge, linking the eastern halves of Portland and Vancouver, Washington. Also known as the Veterans Memorial Highway, I-205 constitutes the second major north-south route through the metro area. Drivers heading through the region on their way to Seattle or Salem often prefer I-205 to I-5 as it is newer, wider, and generally an easier way to pass through Portland and its suburbs. Moving south to north, major junctions along I-205 in Oregon occur at Oregon 43 (exit 8), Oregon 99E (exit 9), Oregon 213 (exits 10 and 13), Oregon 212 and Oregon 224 (exits 12A and 13), U.S. 26 (exit 19), Interstate 84/U.S. 30 (exits 21AB and 22) and the Portland International Airport/Airport Way (exit 24). Mileage-based exit numbering begins in Tualatin and continues accumulating without resetting to zero once the freeway crosses into Washington State. This 3.5-mile urban loop forms the western portion of a continuous freeway ring that encircles downtown Portland. Both the southern and northern terminus of I-405 consist of elevated stack interchanges with Interstate 5. Rather than disrupting the flow of long-established downtown streets, I-405 travels below grade for most of its journey, and a series of overpasses carries the surface streets over the freeway. Exit 1D provides access to U.S. 26 (Sunset Highway), westbound to Beaverton, Hillsboro, and the Oregon coast. Northbound I-405 moves quickly on to the approach to exit 3 (U.S. 30 westbound), and then crosses the Willamette River over the two-level Fremont Bridge. Southbound traffic crosses on the top deck, while northbound traffic is relegated to the less scenic lower deck. Construction on Interstate 405 began in 1964, and the freeway opened in two stages: everything except the Fremont Bridge opened on February 25, 1969, and the Fremont Bridge opened on November 11, 1973. U.S. 26 leads a double-life in the Portland area. On the east side of the Willamette River, it is routed along a major east-west surface arterial route, Powell Boulevard. 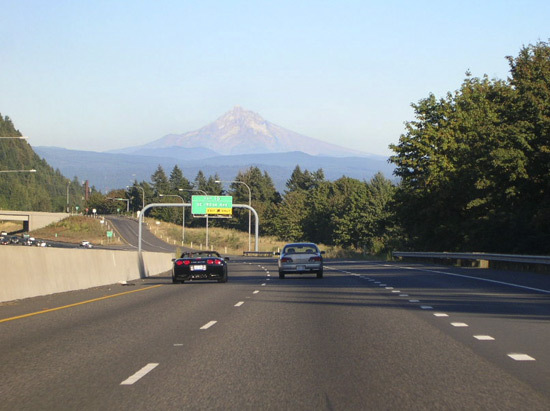 On the west side of Portland, U.S. 26 is primarily carried by the Sunset Highway, a multi-laned controlled-access freeway. Crossing the Willamette River over the aging Ross Island Bridge, westbound U.S. 26 is routed along a maze of surface streets before finally joining with Interstate 405 at the 6th Avenue entrance ramp immediately south of downtown. U.S. 26 exits the Stadium Freeway at I-405 exit 1D, and begins its life as the Sunset Highway. The controlled-access portion of the Sunset Highway runs southeast-northwest through west Portland connecting the city to the suburbs of Beaverton and Hillsboro. Westbound U.S. 26 reverts to an ordinary at-grade highway just past exit 55. 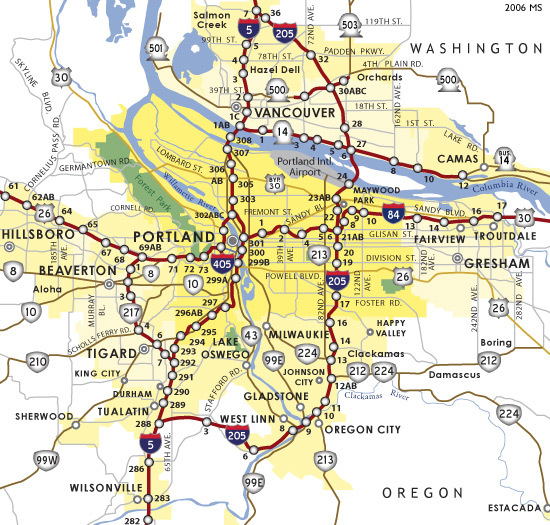 Major junctions along U.S. 26 in the Portland Metro area, from west to east, are with Oregon 6 (just west of exit 55), Oregon 217 (exit 69 A), Interstates 405 and 5 near downtown, Oregon 213 (intersection of Powell Blvd. and 82nd Avenue), Interstate 205, and Oregon 212 in Boring. Eastbound U.S. 26 (Sunset Highway) approaches Exit 64 near Beaverton. Photo by Matt Strieby (06/19/05). Like U.S. 26, U.S. 30 can also be partitioned into two distinct routes in the Portland area. East of the Willamette, it is carried along with Interstate 84 (Banfield Freeway), and the two routes are somewhat inconsistently co-signed. When the westbound Banfield reaches its end at Interstate 5, U.S. 30 is briefly routed with I-5, until it departs for I-405 and the Fremont Bridge at exit 302C. 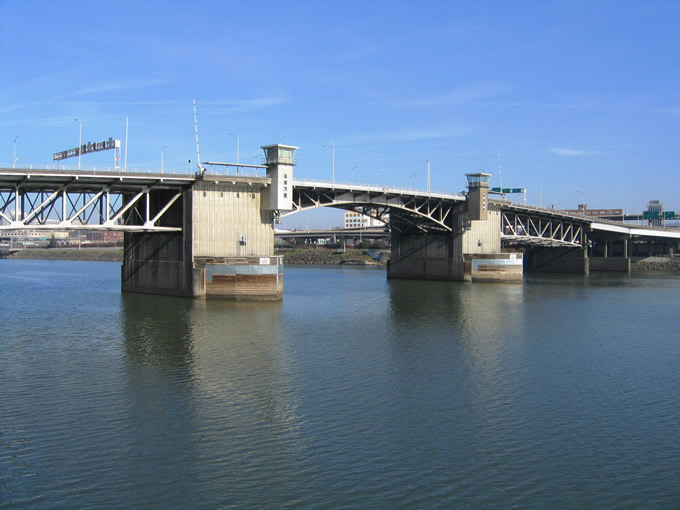 Crossing over the Willamette River into northwest Portland, U.S. 30 leaves I-405 and travels as a surface arterial, first along Yeon Avenue and then on St. Helens Road, at a southeast-to-northwest trajectory, following the Columbia River. Though the “bypass” designation for U.S. 30 may seem irrelevant in this era of freeways, it is a vestige of pre-freeway times. The bypass route begins at I-84/ U.S. 30 exit 16 and then travels along Sandy Boulevard into Parkrose, where the business route formerly split from it. At Parkrose, Sandy Boulevard changes trajectory to a NE to SW course and the U.S. 30 Bypass continues west as Killingsworth Street. West of 72nd Avenue, the bypass route breaks from Killingsworth Street and follows Portland Highway/ Lombard Street along the northern shoulder of Portland. In north Portland, U.S. 30 bypass is carried along Philadelphia Avenue where it crosses the Willamette River over the beautiful St. Johns Bridge. The bypass route rejoins U.S. 30 (St. Helens Road) at the western end of the St. Johns Bridge. The now-decomissioned business route formerly split from the bypass in Parkrose and followed Sandy Boulevard into the heart of the city where it crossed the Burnside Bridge into downtown. Up until 2007, there were still some Business 30 shields in place along Sandy Boulevard. Sandy Boulevard (former U.S. 30 Business Route), looking east near the Hollywood District. Photo by Matt Strieby (07/13/05). Oregon 8 is a mostly urban surface route on the metro area’s west side, connecting the cities of Portland, Beaverton, Hillsboro, Cornelius, and Forest Grove. Heading west, Oregon 8 departs from U.S. 26 at exit 71 to become Canyon Road in Beaverton. In downtown Beaverton, Oregon 8 brushes by Oregon 10 (though the two don’t actually meet) and then heads west as the Tualatin Valley (“TV”) Highway, linking Beaverton and Hillsboro. Shield assembly at the junction of Oregon 8 and Oregon 219 in Hillsboro. Photo by Matt Strieby (02/05/05). Like Oregon 8, Oregon 10 is a westside surface highway that undergoes several name and route changes as it heads west through Portland and Beaverton. It is briefly co-signed with Oregon 99W (Barbur Boulevard), but departs from 99W at Capitol Highway and is soon routed along the Beaverton-Hillsdale Highway. After crossing Oregon 217 near downtown Beaverton, Oregon 10 becomes Farmington Road. Oregon 43 is a strictly urban route that roughly follows the west bank of the Willamette River south of Portland. A surface-level arterial, the highway connects southwest Portland (Macadam Avenue) with the city of West Linn, passing through Lake Oswego in between. Oregon 43 reaches its southern terminus at Interstate 205. Oregon 99E is former U.S. 99E, the eastern branch of the old Pacific Highway in the Portland area. 99E, along with its western counterpart 99W, was removed from the federal highway system in 1972. Entering the metro area in the south at Oregon City, 99E crosses the Clackamas River and heads north through Gladstone and Milwaukie and finally into Portland as S.E. McLoughlin Boulevard. 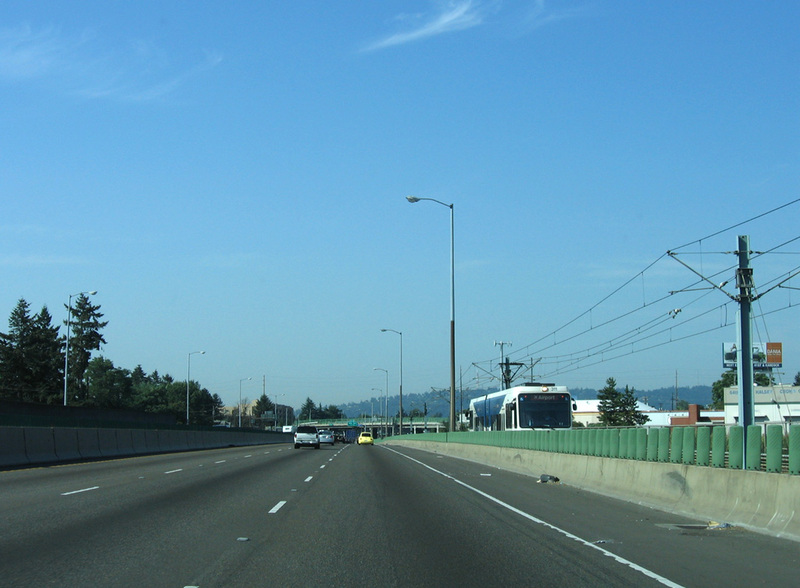 Approaching the city center, 99E is routed along the Martin Luther King, Jr. Boulevard/ Grand Avenue one-way couplet, and finally along just MLK before joining Interstate 5 at I-5 exit 307. Historically, MLK Boulevard was known as Union Avenue, a name that originates from the turn of the 20th Century when East Portland was a separate city. The western branch of the Pacific Highway, 99W was removed from the US highway system along with its eastern counterpart (99E) in 1972. Oregon 99W originates at its split with 99E in Junction City north of Eugene and enters the southern Portland Metro Area at Sherwood. 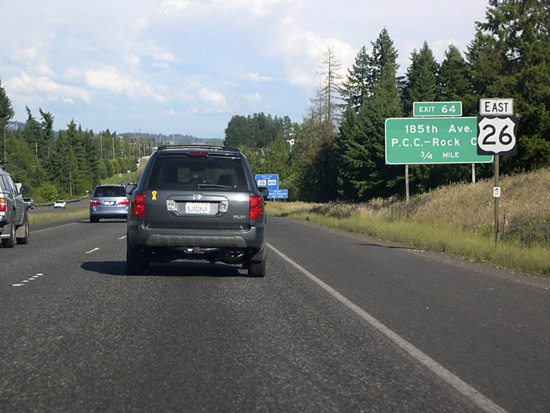 Passing through Tualatin, King City, and Tigard, the highway enters Portland city limits at its junction with Interstate 5 (I-5 exit 294). Inside SW Portland, Oregon 99W travels along SW Barbur Boulevard to and from downtown and it is briefly coupled with Oregon 10 just south of downtown. From there, the exact northern terminus of 99W is quite hazy, though it probably ends just south of the southern Interstate 5/ Interstate 405 stack interchange, where Naito Parkway meets U.S. 26 at the west end of the Ross Island Bridge. The ODOT official state highway map shows it continuing past the interchange along Naito Parkway. North Interstate Avenue (former U.S. 99W/ Oregon 99W) at North Alberta Street. 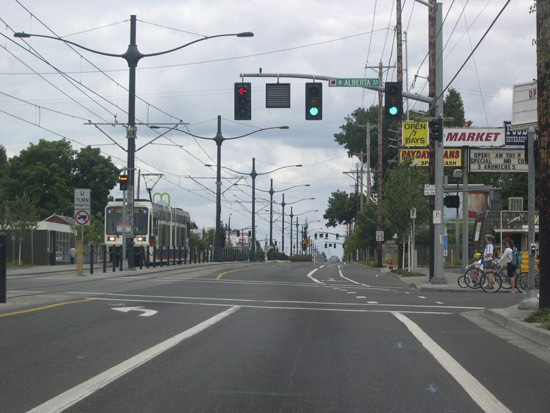 The Interstate Avenue MAX line that now bisects this arterial street was completed in 2004. Photo by Matt Strieby (06/18/06). Oregon 210 branches from Oregon 10 at Raleigh Hills, just east of the Beaverton city limits. Running roughly northeast to southwest, Oregon 210 skirts along the eastern edge of Beaverton and meets Oregon 217 at Tigard. Continuing southwest, the highway constitutes the de facto boundary between Beaverton and Tigard. The effects of Portland’s urban growth boundary are easily seen as Oregon 210 abruptly leaves urban build-up at the southwest corner of Beaverton and enters lush Willamette Valley farmland before meeting its southwestern terminus at Oregon 219. At its western terminus, Oregon 212 departs from Interstate 205 at Clackamas (I-205 exits 12 and 12A), where it shares a roadbed with Oregon 224 as the Clackamas Highway. Oregon 212 and 224 split about three miles east of I-205. 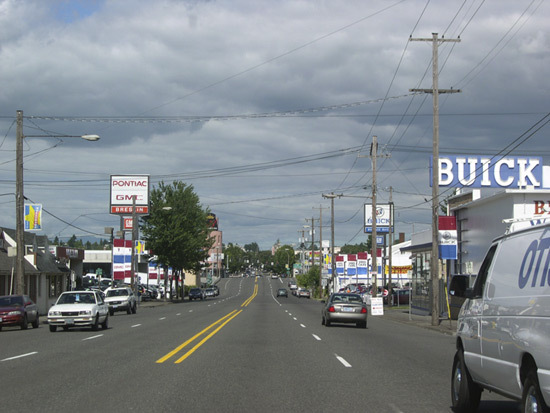 Driving is mostly suburban along Oregon 212 as it continues east as the Clackamas-Boring Highway, passing through the small communities of Damascus and Boring before it ends at US 26 southeast of Gresham. Like so many Portland-area highways, Oregon 213 is known by more than one name. Entering the metro area in the south at Oregon City as the Cascade Highway, it skirts the eastern edge of the town before it is absorbed into I-205 just south of the Clackamas River crossing. Oregon 213 is routed along I-205 for about a 3-mile stretch (though it is not co-signed with the interstate) before departing the freeway at exit 13 in Clackamas. 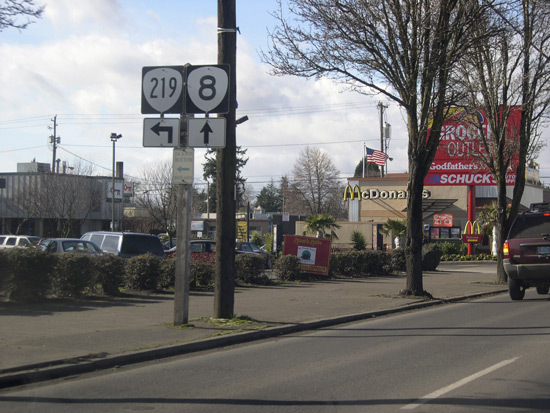 Oregon 213 enters Portland as 82nd Avenue, and continues as a north-south arterial. For a short distance between U.S. 30/Killingsworth Street and Airport Way, Oregon 213 is a controlled-access highway. This seven-mile controlled-access highway links, as the name implies, the satellite communities of Beaverton and Tigard on the metro area’s west side. Starting at the south at I-5 exit 292, Oregon 217 meets Oregon 99W (exit 6), Oregon 210 (exit 4), Oregon 8 and Oregon 10 (exit 2A) and finally U.S. 26 at its northern terminus. East of Interstate 205, Oregon 224 shares pavement with Oregon 212 for about three miles before the two split and Oregon 224 heads southeast towards Estacada. The western section of Oregon 224 departs I-205 at exit 13 and serves as a major arterial highway heading into the suburban city of Milwaukie. Though there are interchanges at Lake Road and McLouglin Boulevard, Oregon 224 is largely a multi-lane at-grade highway with traffic lights at the major intersections. Interstate 5 extends its journey through the Portland Metropolitian area as one of several freeways that service Vancouver, Washington. Though there is no definitive boundary to the metro area, southbound I-5 in Washington starts encountering heavy urban build-up after passing exit 9 (179th Street/SR-502 east). North of the Columbia River, Interstate 205 services the eastern half of Vancouver. I-205 meets Washington 14 at exit 27 and Washington 500 at a full cloverleaf interchange (exits 30A, 30B, and 30C) before rejoining Interstate 5 just north of exit 36 (NE 134th Street) in Salmon Creek. U.S. 830, decomissioned in 1968, was the highest-numbered U.S. Route ever, and ran along the north bank of the Columbia River roughly parallel with U.S. 30 on the southbank.6 The portion from Maryhill, Washington to Vancouver is now designated as Washington State Route 14. Washington 14 enters the metro area in the east at Washougal and bypasses the business districts of both Washougal and Camas, staying close to the Columbia River. Passing into the west end of Camas, SR-14 becomes the Lewis and Clark Freeway (many maps still label it as the “Lewis and Clark Highway”), a full-fledged controlled access highway which continues uninterrupted to its western terminus at Interstate 5 in downtown Vancouver. After Interstate 84 and U.S. 26, SR-14 comprises a third major east-west freeway in the Portland metro area. Mount Hood looms over Washington 14 (Lewis and Clark Freeway) in this view near Exit 10. Photo by Matt Strieby (08/27/05). The SR 14 business route connects the business districts of neighboring towns Camas and Washougal, both on the north bank of the Columbia River. State Route 500 is an east-west expressway that links Interstate 5 and the Vancouver area’s eastern businesses and neighborhoods at Orchards. There are still signaled intersections, but recent improvements to the highway have added three new SPUIs (single point urban interchanges): at Andresen Road, Thurston Way, and 112th Avenue/Gher Road. Otherwise, SR-500 has a partial interchange with Interstate 5 at its western terminus, and a full interchange with I-205 in east Vancouver. The route defaults to surface streets beyond the 112th Avenue interchange. SR-502 links Interstate 5 with the community of Battle Ground. Currently the highway exits I-5 at exit 9 and is then routed two miles as a north-south route before changing to an east-west route at N.E. 219th Street. A new interchange currently under construction at the Gee Creek Rest area will provide a direct access to the east-west portion. This north-south route links Orchards (an unincorporated area northeast of Vancouver) and Battle Ground. Hawthorne Bridge Information, http://www.co.multnomah.or.us/bridge/hawthorne_bridge/hawtinfo.html Multnomah County, Oregon. Morrison Bridge Information, http://www.co.multnomah.or.us/bridge/morrison_bridge/morrinfo.html Multnomah County, Oregon.